Built ca. 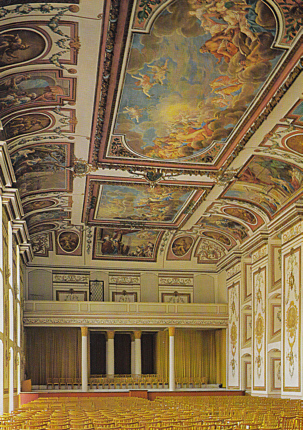 1663-1672 during a renovation of the Eszterházy Palace by Carlo Martino Carlone for Duke Paul Eszterházy. During the ca. 40 years that Joseph Haydn worked as a court composer and conductor in Eisenstadt from 1761, many of his works have been premiered in the Haydnsaal. After 1794 renovations for Duke Nikolaus II. Eszterházy. Ceiling fresco by Carpofor Tencala. Later installation of a balcony. The hall is famous for its excellent acoustics. 600 seats. Home to the "Österreichisch-Ungarische Haydn-Philharmonie / Osztrák-Magyar Haydn Zenekar" orchestra. Used for performances during the annual "Haydn Festspiele Eisenstadt", and for classical and popular concerts throughout the year. 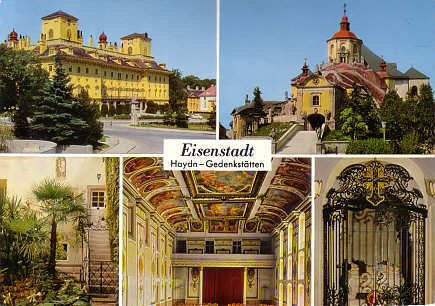 Reverse Text: "Schloß Esterhazy - Haydnsaal - Eisenstadt - Burgenland - Österreich"
Front Text: "Eisenstadt - Haydn-Gedenkstätten"
Reverse Text: "Eisenstadt - Haydngedenkstätten - Schloß Esterhazy, Bergkirche, Haydnhaus, Schloß Esterhazy/Haydnsaal, Mausoleum - Burgenland - Österreich"